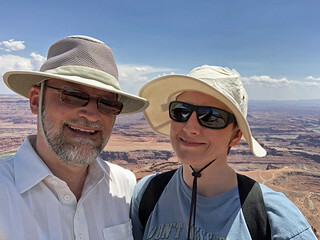 After completing our tour of Antelope Canyon and having lunch in Page, Arizona, we had a five-hour drive to reach our trip’s penultimate hotel in Moab, Utah. 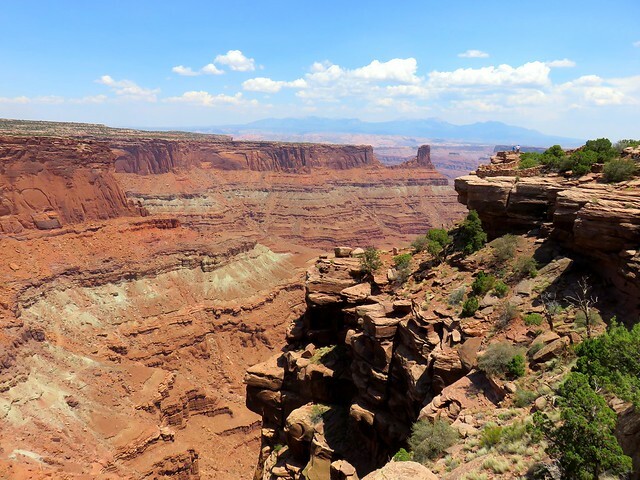 Although Moab is only 155 miles northeast of Page, and they both lie along the Colorado River, the highway route is 270 miles. One has to travel east for hours across the arid landscape of the Navajo Reservation before turning north. We turned off at Kaibito for a restroom break, but I allowed our TomTom GPS to guide us along a bumpy dirt road to return to the highway, something Wendy did not appreciate. She declared a moratorium on unpaved back roads for the remainder of the trip. 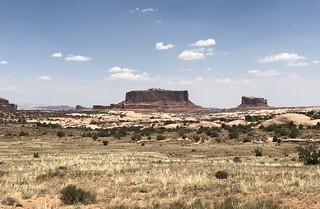 We passed sandstone buttes that reminded us we were passing within a dozen miles of Monument Valley, made famous in the westerns of John Ford. I’d originally planned to divert to see it, but couldn’t make that work out given the availability and timing of our slot canyon tour. So we only admired small buttes in passing as we journeyed to Moab. We were both weary and hungry by the time we reached Wilson Arch, 24 miles south of Moab. 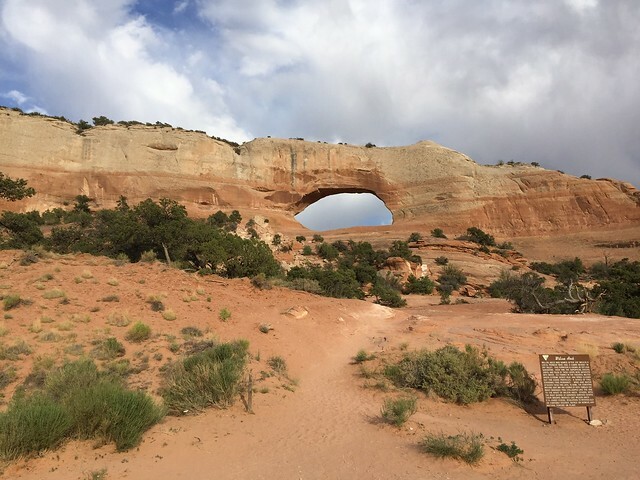 It spans 91 feet and rises 46 feet above the desert floor and was the largest arch we saw on the trip, having decided to forgo Arches National Park just north of Moab to concentrate on other less popular attractions. Soon we were driving northwest up Spanish Valley towards Moab’s downtown at its far end. Arriving late, we pulled into a Wendy’s for dinner. While driving back through town to the Best Western Plus Canyonlands Inn, we passed a truck that someone had converted into a hiking boot. 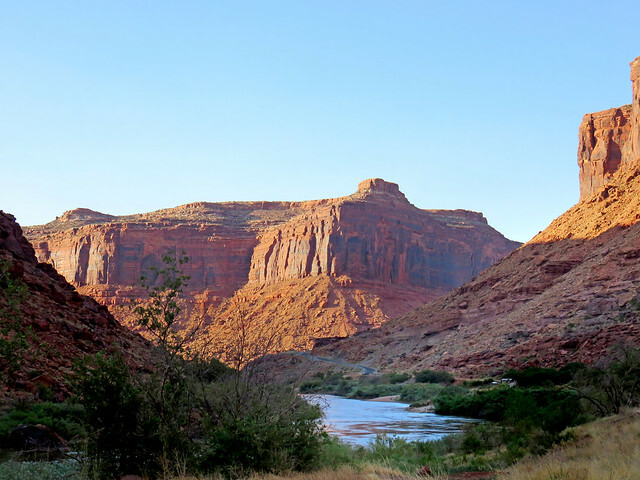 In addition to hiking and mountain biking, the area also offers kayaking and boating along the Colorado River and four-wheeling across the desert mesas. The small town’s catering to tourists comes after a uranium mining boom that began in the 1950s and lasted until the 1980s. The Christian Bible tells of Moab, lands located east of the Dead Sea. However, early residents of the Utah town were uncomfortable with the name, as the Bible claims the Moabites descended from a titular ancestor conceived when Lot’s eldest daughter, sheltering with him and her sister in a cave after the destruction of Sodom and Gomorrah, got him drunk and they incestuously conceived a son. Much earlier in its history, there were petitions to change Moab’s name, but those failed. The next day we enjoyed lunch at Sweet Cravings Bakery & Bistro, and would return for lunch the following day as well. Their paninis were fresh and delicious. I had them put turkey and swiss with mayo and lettuce on sourdough, while Wendy ordered their Adventure Inn panini, substituting cranberry sauce for the mayo and adding jalapeño jelly and cream cheese. After lunch we headed north past the Colorado River and turned west on Highway 313 towards Dead Horse Point. 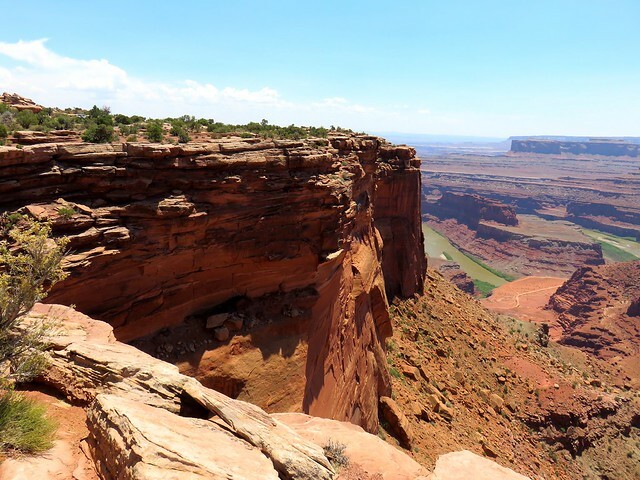 I’d read online that the free state park offered spectacular views of the Colorado and surrounding canyons and was a closer and free alternative to Canyonlands National Park. 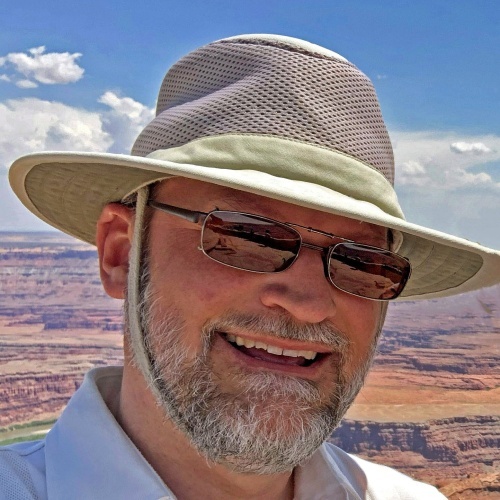 The name was a bit offputting, arising from a legend that the point of the mesa high above the Colorado was once used as a corral for wild mustangs. Cowboys rounded them up, herded them across a narrow neck of land, and then fenced that off with branches and brush. Horses were selected from the herd corralled by the steep cliffs falling off on each side. The sad part of the legend is that the remaining horses were left to die of thirst, trapped on the point 2,000 feet above the Colorado. Along the way, we paused to take in the panoramic view of Big Mesa to the north. Two smaller mesas were visible to the northeast. The views from the Rim Trail as we approached the visitor center were impressive, with rugged eroded canyons in the foreground and background mountains. Bright blue colors visible on the distant floor in the panoramic shot were not the Colorado River, which is quite green, but instead potash evaporation ponds lined with vinyl and partially filled with tinted water. Potash is potassium chloride and used in plant fertilizer. A mine pumps water down into the Paradox Formation to dissolve the potassium chloride salt. The water is then pumped up into the ponds to evaporate, leaving behind the salt to be harvested by twenty-ton scrapers. At the park’s visitor center, we took in the sweeping view to the east. The Colorado River meandered by 2,000 feet below. We enjoyed shopping at the gift shop, which was well stocked with interesting items. It was a short drive south from there to the point itself, where we passed through an example corral fence at the neck. 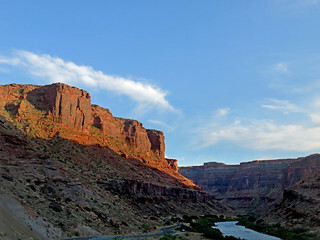 There was an overlook of a gooseneck bend in the Colorado at the point, with a large structure offering welcome shade. We had come prepared for the harsh ultraviolet assault and posed for a selfie in our wide-brimmed hats. Then we took in the view of the basin to the west. Thousands of feet below we could spot rafts cruising on the Colorado. 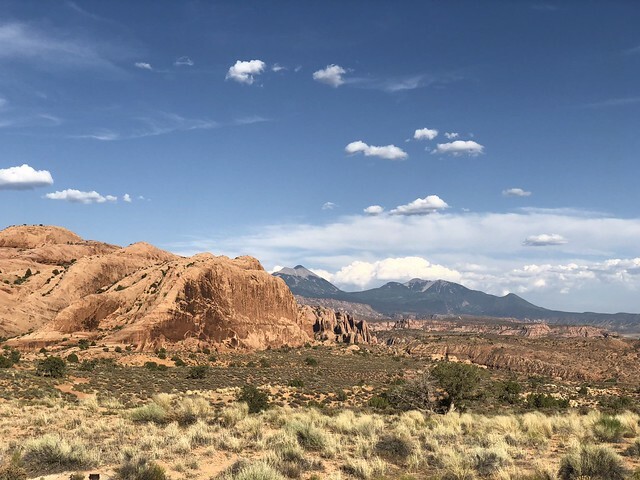 That evening we drove to the south end of Moab and circled back along its east side, climbing the valley wall toward the sand flats for panoramic views to the south towards the red cliffs of the valley’s opposite wall and the peaks of the La Sal mountains 20 miles to the southeast. The terrain was rough and varied as we climbed towards the sand flats. Enthused by the views in the golden hour of the evening, we decided to drive north to the Colorado River and drive east along Highway 128 along its south bank. Sheer vertical cliffs, stained with desert varnish, rose to 900 feet above river as we meandered 15 miles upstream to the northeast. It was another stunningly beautiful scenic drive in Utah and a wonderful end to the day. The next day we packed up for the return to Salt Lake City. We stopped in at Sweet Cravings again for lunch, and Wendy enjoyed shopping at Lin Ottinger’s Rock Shop. Then we drove northwest for 4.5 hours to the airport in Salt Lake. 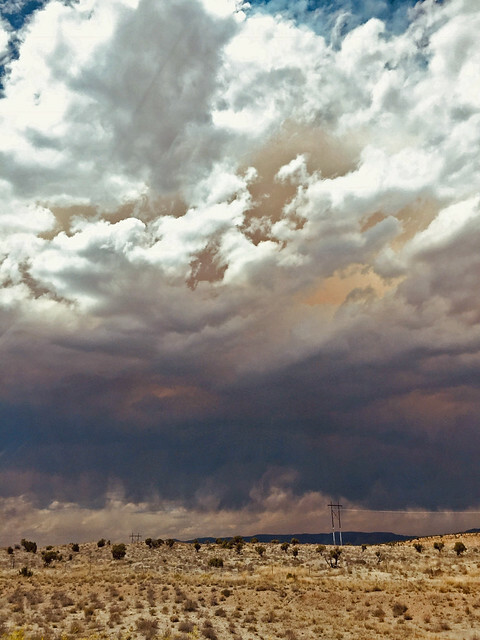 We saw rain falling across the landscape and odd yellow gaps in the storm clouds. Eventually we were headed north on I-15, managing to hit rush hour traffic as we drove north along the Wasatch Range. Trixie the TomTom GPS app guided us along, warning us about impending traffic jams and how long it would take us to clear them. It steered us onto the I-215 beltway to finally arrive, road and traffic weary, at a Courtyard by Marriott. We checked in and walked over to Roberts Restaurant for a delicious dinner. Wendy enjoyed some salmon, while I feasted on an excellent steak. The next morning we checked our Ford Fusion in at the airport and flew back to Tulsa. After so many days in the arid high desert, we both were struck by how green the landscape appeared as we descended. We were back in Green Country and glad to be home. I suspect that we will aim for a cooler area of the country for our June 2019 getaway. But we enjoyed some truly spectacular scenery looping across the high deserts of Utah and far northern Arizona on our arid adventure. This entry was posted in photos, travel. Bookmark the permalink.